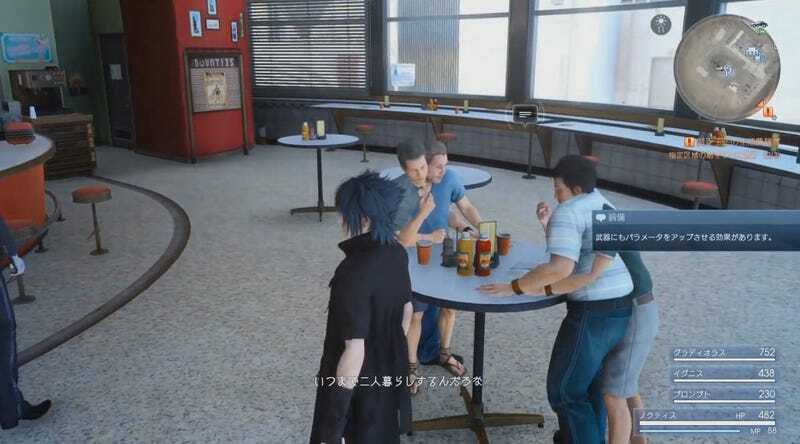 Dude hugs are not only a bug in the new Japan-only Final Fantasy XV demo, but they’re also a feature. They certainly make this restaurant more friendly! As reported yesterday, Square Enix just released a new Final Fantasy XV demo in Japan for folks to judge as to whether they will purchase the game. From the looks of it, the demo sure seems buggy. Demos are often buggy, so what’s the big deal, right? Traditionally, Japanese gamers have been less forgiving than Western players about glitchy games. But more importantly, back in late August, Final Fantasy XV director Hajime Tabata said the game was delayed to clean up bugs. Like this affectionate one, I guess. 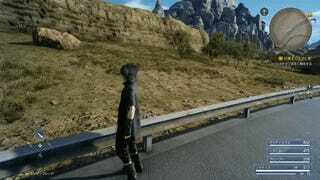 At that time, Tabata explained that since not every FFXV player in Japan had their console connected to the internet, the goal was to get the game as glitch-free as possible. Yet, here we are, the last demo right before release, and loads of bugs. There are a couple weeks before launch, so hopefully Square Enix can squash these. But in the meantime, if you like bugs, the ones in the Judgment Disc demo are pretty good! One, for example, has non-playable characters seeming to embrace each other. The text reads, “Huh? The heck’s that?” Heh. There are other bugs and glitches that people are also finding, like this bright as hell light. Final Fantasy XV will be out November 29.